Circa 1993, I joined an engineering course in Bombay University. Because, well, that’s the least any self-worthy TamBrahm had to do if he hadn’t cracked the JEE. Doing anything else, like, say, a graduation in science or Arts (Oh! Murugaa! ), would have been an insult to all the curd-rice and mango pickle you had eaten in the seventeen odd years of your life. An Engineering degree is not merely a degree; there is a lot more to it than just that. Engineering equips you with invaluable life lessons. Engineers start off battling the disadvantage of others having higher expectations from them. Why else would passing marks be forty instead of the normal thirty-five in other courses. In the words of some-one-famous-I-don’t-know, this journey is far more interesting than the destination. Your life lessons begin in the first year with Big Four. Mention ‘Big Four’ to an engineer from Bombay University (ok, Mumbai University, if you say so Raj) and you will see an expression normally seen on survivors of violent crimes. It’s called post-traumatic stress, I think. Big-Four, for the benefit of my non-Engineer friends, refers to the dreaded four first year subjects of; Basic Electricals and Electronics (referred to as B-double-E), Mathematics, Engineering Drawing and Mechanics (aka Mech). If you didn’t score at least forty out of a hundred marks in the exams, you would get a KT, that’s short for ATKT (Allowed to Keep Terms). This meant that while you failed the exam, Bombay University, in its magnanimity would let you carry on to the next semester and permit you to attempt these subjects again. It’s like letting Ramu make his next film after ‘Ram Gopal Verma ki Aag’. Getting a KT in at least one of the ‘Big-Four’ or all of them was par for the course. Quite like how any soldier worth his salt would return from battle with at least a bullet wound, a worthy engineer from Bombay University would have at least one KT in the Big Four. Scraping through first year engineering and the Big Four prepares an engineer for life. You learn a life lesson – much like the fable of ‘Bruce and the spider’ – try and try harder till you pass. Multiple attempts and reattempts teach an engineer the value of tenacity and to plod on, shamelessly. Then there is glass tracing, fondly called – GT. GT has saved hordes from the sheer boredom of Engineering. Folks who are a dab hand at this art know the process. You first get the class nerd to finish his Engineering Drawing sheet. Then grab his completed sheet, clip it on a contraption made of a glass sheet with a light bulb shoved underneath and trace the complicated thingamajig onto your sheet in 10 minutes flat. What elevates this mere tracing to the fine art-of-the-con (that it is) is removing all traces of, well, the trace lines, pencil lead marks from underneath the sheet and poking small holes to mimic the place where the compass would have been placed to make the drawing. The two hours you saved by doing a GT and not actually making the engineering drawing sheet is better utilized for spiritual pursuits. The innocuous and simple task of GT offers a valuable life lesson to engineers – do not reinvent the wheel and if there is an easier way of doing something – do that. This is a useful corporate life survival skill. Need to present to the Board at 7 am on a Monday morning? No problem. A lot can be achieved with skillful copy-paste from old presentations and some clever use of graphics. Your presentation will look fresh, crisp and insightful. There is no need to waste week-ends and make pointless presentations, thanks to some rigorous GT training you’ve had in your formative years. Engineering courses were dominated by boys (not sure how classes are stacked up these days) and sighting a girl in a mechanical engineering course was as common as Sunny Leone in mythological serials. Unlike the blokes who studied Arts, four years in engineering is the closest boys get to a Seminary. Testosterone rages are doused; boys master themselves and their urges in the four years. Life’s maxim is learnt – self-help is the best help. You need to study to get through the current semester, pass the KT exam from the prior semester and scrape through the last KT left over from the semester prior to that. Then there are assignments to submit, group study sessions, participation in college fests, juggling exam dates and notes (photocopied, of course). Life lessons in multi-tasking learnt from your days in engineering help you deftly juggle multiple project deadlines, screaming clients and bosses in corporate life. Then there is the viva voce, where you are expected to answer orally, questions posed by an examiner. There are three clear methods of getting through these examinations – plead, beg or grovel. It’s also involves the deft art of sounding knowledgeable despite having started cramming lessons barely a day earlier. Making convincing sounding pitches to clients, breathing conviction and confidence into presentations which you glanced only once in the elevator enroute to the meeting are born out of the life lessons learnt from the viva voce of your BE days. 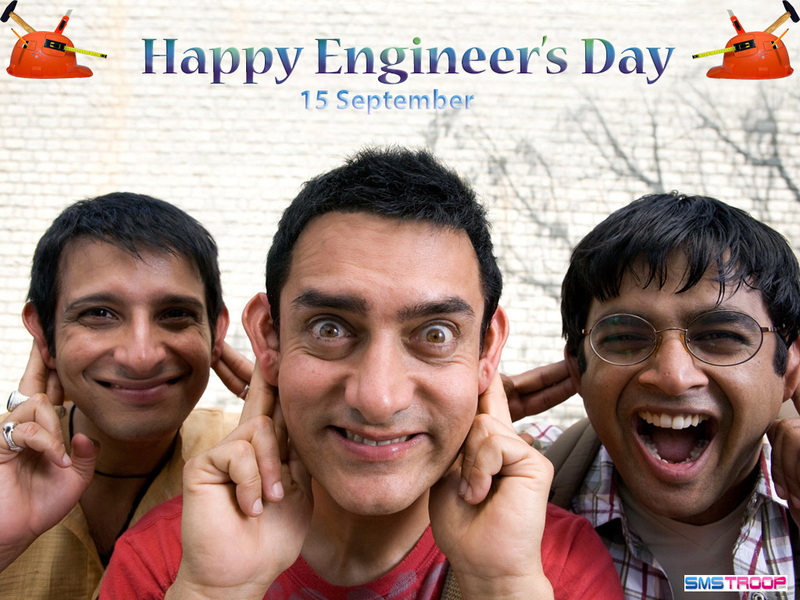 15 September, is Engineers Day in India. It is celebrated in honor of an engineer par excellence, Visvesvaraya’s, birthday. But you who-scraped-through-engineering can celebrate it too. To Set Squares and Drafter. To A2 paper. To 40 marks. To Workshop and lessons in welding. A toast to the life lessons learnt, to surviving the four years and to just BE. Oh!!! the memories!!! Wonderfully captured Prasad. . .